Robin Herd And Witchcraft At Jimmy Swaggart Ministries! Would you believe me if I said we’re going to do another “Jimmy Swaggart Sermonet”? Well, truth is stranger than fiction… and the truth in this one will blow you away! Because you see this sermonet – “Robin Herd And Witchcraft At Jimmy Swaggart Ministries!” – will be Part XII in our long running series on “Music And The Devil”. And it’s the Devil in the album on the right that’s going to be the focus of this week’s message. My deepest appreciation to John Todd, Ex-Grand Druid Priest, for the authenticity of the occult information used in this story. Also to those others who came out of witchcraft and have verified this material. 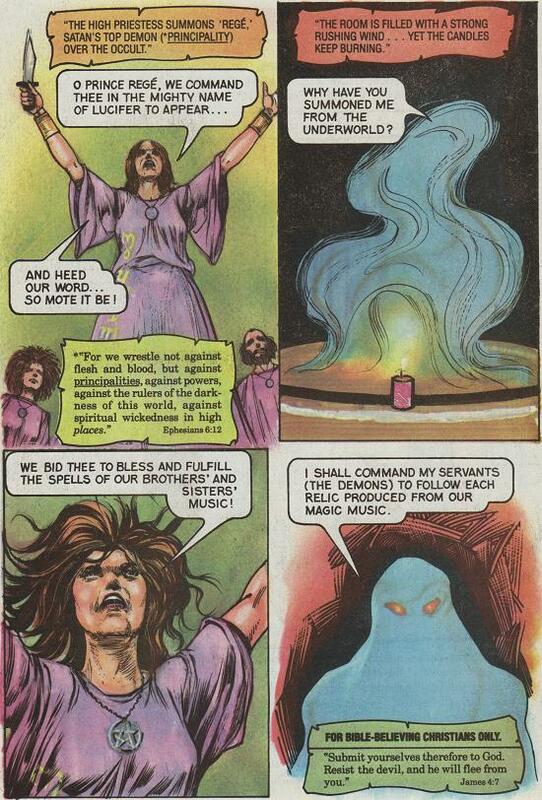 John Todd, Ex-Grand Druid Priest, provided factual input that helped Jack Chick write his comic. And, of course, the “ex” means that Satan had used John Todd mightily to perform witchcraft as a Grand Druid Priest until Labor Day of 1972 when he came into a saving relationship with Jesus Christ. And it was at that point in time that John Todd promised the Lord God Almighty that he would use his knowledge of the occult to expose Satan’s hidden agenda (“John Todd And The Illuminati”). Maranatha! Music was founded in 1971 by Chuck Smith Sr. of Calvary Chapel to promote the “Jesus Music” his young hippie followers were writing and singing up and down the California coast. In the early years, Maranatha! Music signed artists because of their passionate profession of faith through music. These songs became the seminal calling card of the worship music genre of that time and belonged to the Maranatha! song catalog. Back then, these songs were on the fringe of what the established church felt was appropriate for church music but they were being sung by millions of young people around the world. You see Chuck Smith is very much so involved in Illumimati witchcraft. In fact, it was during the time John Todd was Grand Druid Priest that he was given the responsibility of personally delivering the second four (4) million dollar check [eight (8) million dollars total] to Chuck Smith which would be used to create Calvary Chapel Maranatha Productions. And the reason the Illuminati invested so much money in Chuck Smith’s recording studio was so that he could produce the satanic “Jesus Rock” that would be used to invade and overcome “The Church” through it’s subversion of musical witchcraft. But anyway, during John Todd’s tenure as Grand Druid Priest he also held the position of Managing President over Zodiac Productions – the largest recording conglomerate in the world at that time. It owned RCA Records, Columbia Records, and Motown Records (to name just a few), and almost all of the concert booking agencies in the USA. And, of course, what took place with all their music recordings was anything but nice. You see, according to John Todd, on the night of a full moon the master recordings would be taken to a “Temple Room” located in every one of the major music companies. The master recordings would then be placed on an altar at the north end of the “Temple Room” where a pentagram is engraved in the floor. Behind locked doors, thirteen (13) hand-chosen witches and wizards would then conjure up a Principality or Power and order them to tell the demons under them to follow every record and every tape coming off of the master in order to place spells on the people that couldn’t have spells cast on them. Now is that spooky, or is that spooky? You buy the album but the demons come free! And, of course, the Christians who buy these albums are willingly receiving the demonic spirits that come with them. I mean, a witch cannot cast a spell on a true born-again Christian… but the Christian can cast a spell on them self by receiving the spirit that’s in the music. But that’s not all! John Todd went on to say that in order for the musicians to get a recording contract with the record companies, they must go through the “initiation” of becoming a witch. Messing around with “familiar spirits” is serious business… but the musicians do it on a regular basis in order to obtain success. Take for instance the group “Eagles”. They have sold over 120 million albums worldwide, and 100 million in the U.S. alone. They are the fifth-highest-selling music act and highest-selling American band in U.S. history. No other American band sold more records than the Eagles during the 1970s. In fact their “Hotel California” was released on December 8, 1976 as the band's fifth studio album. "Hotel California" topped the Billboard Hot 100 singles chart for one week in May 1977. Three months after its release, the single was certified Gold by the Recording Industry Association of America, representing 1,000,000 records shipped. The Eagles also won the 1977 Grammy Award for Record of the Year for "Hotel California" at the 20th Annual Grammy Awards in 1978. In 2009, the song "Hotel California" was certified Platinum (Digital Sales Award) by the RIAA for sales of 1,000,000 digital downloads. Now, as should be obvious, the song was all about “Hotel California”… and the lyrics ask the daunting question as to whether it’s “Heaven or Hell”! 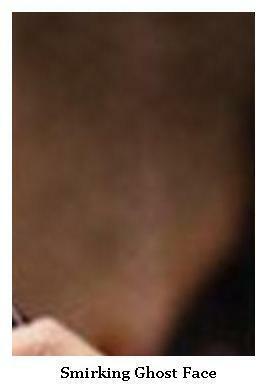 However, by closely examining the album cover insert (below left) we can discover the very obvious answer. 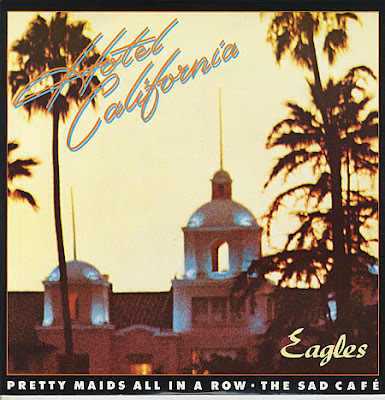 You see the album cover insert shows the “Eagles” along with their host of friends gathered together inside “Hotel California” with the “master of ceremonies” looking down from above. 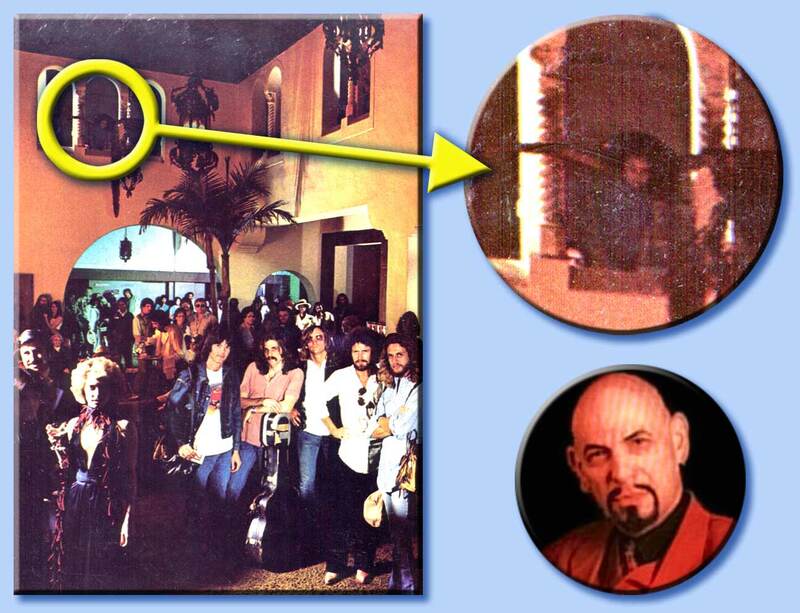 And of course the man peering down from the balcony is none other than Anton LaVey who founded the “Church of Satan” in 1966. In fact it was this “hotel” in “California” (where they are all gathered) that was the first registered “Church Of Satan”... and it was registered in 1969. He said, 'We haven't had that spirit here since 1969. Are you starting to get the picture? I mean, even the Eagles' manager, Larry Salter, admitted in the Waco Tribune-Herald (Feb. 28, 1982), that the Eagles were involved with the Church of Satan! So just in case you haven’t figured it out yet, “Hotel California” is all about “Hell”! And to kinda like confirm it, the Eagles even included a song on that album entitled “Have A Good Day in Hell”. Yeah Satan, oh he came, and organized his own religion. Yeah when he knows he shouldn’t. Yes there are 2 paths you can go on, but in the long run. Here’s to my sweet Satan. I want to live it backwards like the Zep whose power is Satan. So with “Hotel California” in mind, what do you see in Robin Herd’s album cover? You know, the “Jesus Saves” album that was not only recorded live at Family Worship Center but also produced (album cover and all) at Jimmy Swaggart’s ministry. Well, please allow me to show you just one more unbelievable example of “witchcraft in the music industry” through the following three demonic caricatures that were superimposed in the photo of Robin Herd standing on stage at Family Worship Center. And moving on along, this next demonic picture implant is a spirit that I have actually seen possessing a man… and it was anything but nice! It was an “ugly” that you could actually “feel”. This caricature (#2) can be seen just to the right of Robin Herd’s face. What a nice companion to be with him on his “Jesus Saves” album cover, and to be with him in his “Jesus Saves” music! 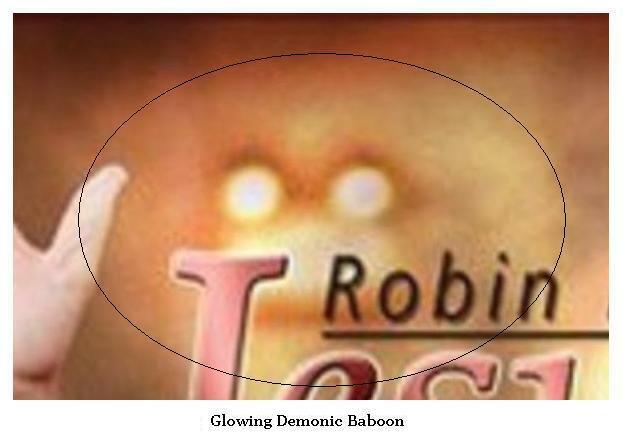 A “smirking ghost face” that mocks the name of “Jesus”… the same “Jesus” that Robin Herd sings about. I mean, after all, Robin Herd has already shown his true colors more than once by “hand signing” his allegiance to Satan as he sings the worship music about Jesus. Witchcraft in the music! What a mockery! 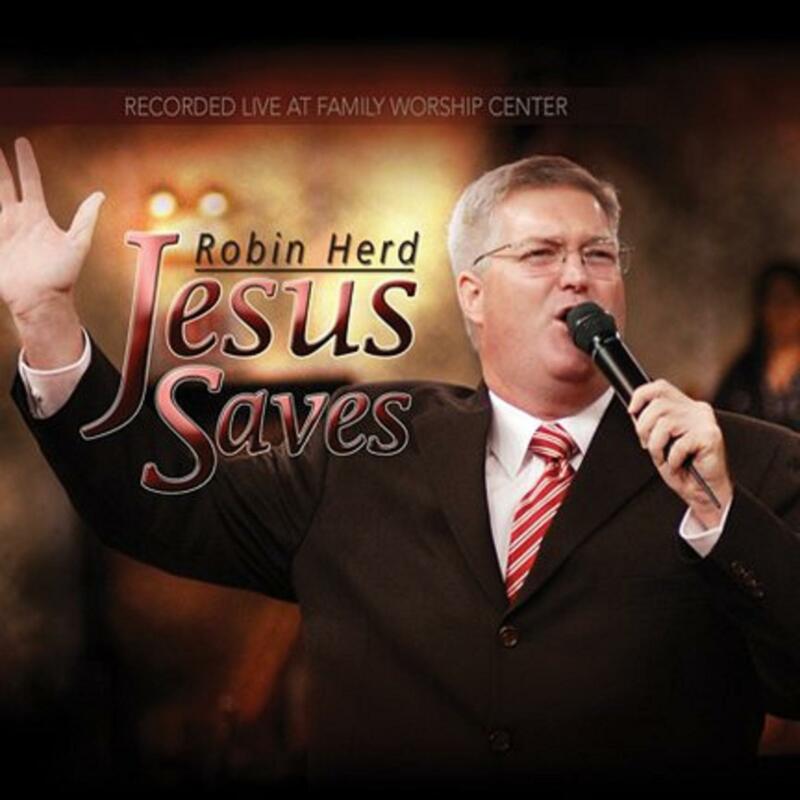 So are you starting to get the BIG picture of Robin Herd’s album cover for his “Jesus Saves” CD? I mean, do you remember John Todd’s testimony about the “Temple Room” with a pentagram engraved in the floor and the altar where the master recording is placed as the thirteen (13) hand-chosen witches and wizards conjure up a Principality or Power to possess the music that will possess the people who receive it’s spirit as they listen to it? You see the Jimmy Swaggart Bible College (WEBC) has been teaching Jimmy Swaggart’s perverted “Message Of The Cross” since Jimmy Swaggart fell with the prostitutes and fell from grace. I mean it was the same prideful spirit in Jimmy Swaggart that caused him to sin in the first place that caused him to re-write the “Gospel Of Jesus Christ” in the end. And, of course, it’s this “another Jesus” and “another cross” that’s taught at WEBC that’s caused the Spirit of God to depart and allowed the “other” spirits to move in. Ichabod: the glory has departed and the spirits of darkness have moved in. But what a perfect environment for the “witches and wizards” to flourish! And flourish they have! * She was a lead singer on the Bible college worship team singing at chapel “services”. * She went to Honduras on a mission trip, acting as Spanish interpreter and preacher. * She worked in Donor Services until leaving on her own accord after a few years. She handled ALL the Spanish calls. All such calls were forwarded to her and she would take their orders, pray with them, etc. 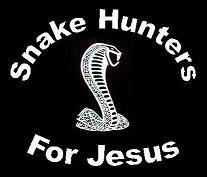 on behalf of Jimmy Swaggart Ministries. 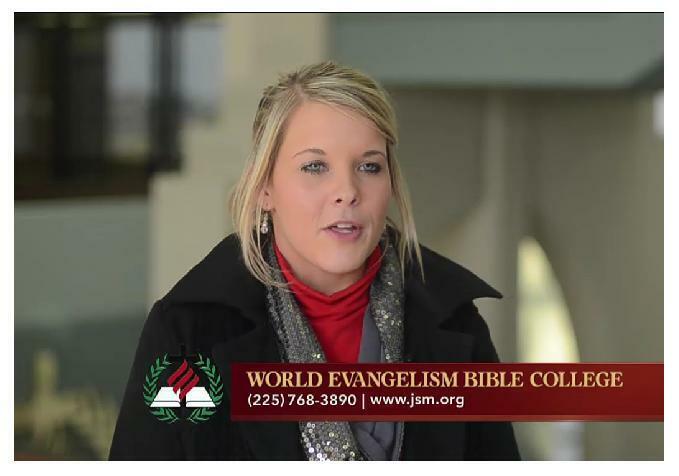 So that’s a little bit more about Erika Lizzet Pina, the “long-term student” and “integral” part of WEBC and Jimmy Swaggart Ministries. In fact, to help us get a better “feel” for the spirit that was working in and through Erika Pina, I was sent a JSM office-wide email in which she was part of the conversation. He’s just ignorant and that to me is ok because all of us could learn something. My problem is, when you refuse to see it or learn when someone tries to help you. Dude needs to get laid and loosen up, lol Any takers??? 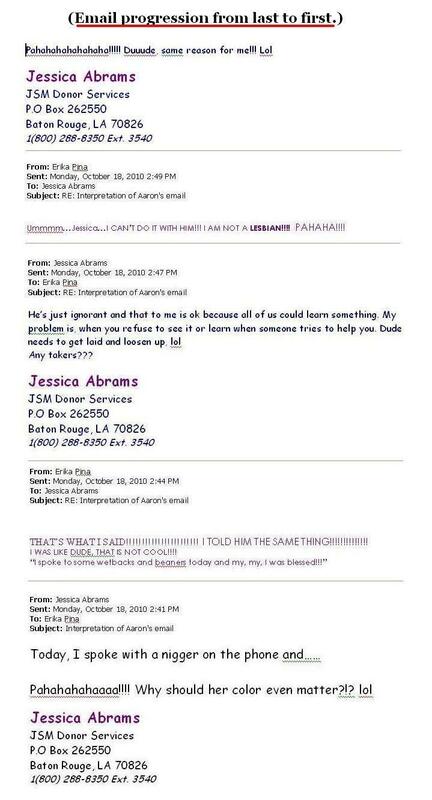 Ummmm…Jessica…I CAN’T DO IT WITH HIM!!! I AM NOT A LESBIAN!!!! PAHAHA!!!! 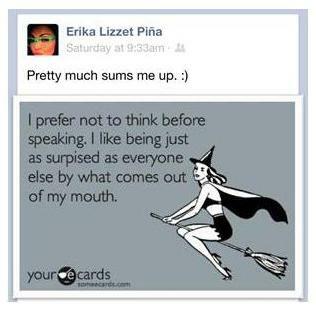 Talk about a “witchy” conversation! Seducing a young “man of God” through fornication was their topic. And of course it was this same form of witchcraft that Balaam used to curse the nation of Israel (Numbers 25:1). I wonder if these two are a part of the thirteen (13) hand-chosen witches and wizards that conjure up a Principality or Power for Jimmy Swaggart’s music? So, Jimmy Swaggart has his own recording studio, and Jimmy Swaggart is openly showing, through his demon infested “Jesus Saves” album cover, the “other spirit” that’s in his music.